I like analogies, as they provide a way of explaining often dry technical concepts in terms we can all relate to. The problem of mobile devices in an IP internetwork can easily be compared to a real-life mobility and information transmission problem: mail delivery for those who travel. To help explain how Mobile IP works, I will set up this analogy and use it as the basis for a look at Mobile IP's general operation. I will also refer back to it in explaining certain concepts in the remaining topics in this section. Suppose you are a consultant working for a large corporation with many offices. Your home office is in London, England, and you spend about half your time there. The rest of the time is split between other offices in say, Rome, Tokyo, New York City and Toronto. You also occasionally visit client sites that can be just about anywhere in the world. You may be at these remote locations for weeks at a time. The problem is: how do you arrange things so that you can receive your mail regardless of your location? You have the same problem that regular IP has with a mobile device, and without taking special steps, the same two unsatisfactory options for resolving it: address changing or decoupling routing from your address. You can't change your address each time you move because you would be modifying it constantly; by the time you told everyone about your new address it would change again. And you certainly can't decouple the routing of mail from your address, unless you want to set up your own postal system! The advantages of this system are many. It is relatively simple to understand and implement. It is also transparent to everyone who sends you mail; they still send to you in London and it gets wherever it needs to go. And handling of the forwarding mechanism is done only by the London PO and possibly the PO where you are presently located; the rest of the postal system doesn't even know anything out of the ordinary is going on. There are some disadvantages of course too. The London PO may allow occasional forwarding for free, but would probably charge you if you did this on a regular basis. You might also need a special arrangement in the city you travel to. You have to keep communicating with your home PO each time you move. And perhaps most importantly, every piece of mail has to be sent through the system twicefirst to London and then to wherever you are locatedwhich is inefficient. Mobile IP works in a manner very similar to the mail forwarding system I just described. The traveling consultant is the device that goes from network to network. Each network can be considered like a different city, and the internetwork of routers is like the postal system. The router that connects any network to the Internet is like that network's post office, from an IP perspective. The mobile node is normally resident on its home network, which is the one that is indicated by the network ID in its IP address. Devices on the internetwork always route using this address, so the pieces of mail (datagrams) always arrive at a router at the device's home. When the device travels to another network, the home router (post office) intercepts these datagrams and forwards them to the device's current address. It may send them straight to the device using a new, temporary address, or it may send them to a router on the device's current network (the other post office, Tokyo in our analogy) for final delivery. An overview of Mobile IP operation can be seen in Figure 128. This diagram is like Figure 127, but with Mobile IP implemented. The mobile nodes home router serves as home agent and the router in Tokyo as the foreign agent. 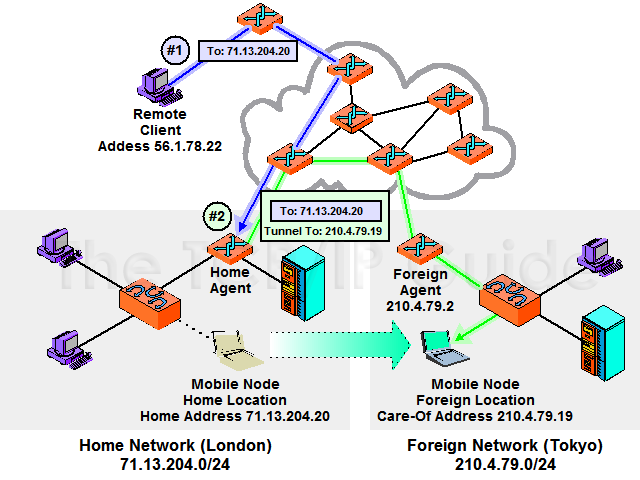 The mobile has been assigned a temporary, care-of address to use while in Tokyo (which in this case is a co-located care-of address, meaning that it is assigned directly to the mobile node; Figure 129 shows the same example using the other type of care-of address). In step #1, the remote client sends a datagram to the mobile using its home address, as before. It arrives in London as usual. In step #2, the home agent encapsulates that datagram in a new one and sends it to the mobile node in Tokyo.